The masked angelfish is naturally found in regions of Hawaii, Midway Islands, and Eastern Central Pacific Ocean. This fish is rarely seen in the wild and is a “must have” for any adventurous fish collector. Juvenile masked angelfish are predominately a stark white color with a small black patch over its face, eyes and mouth, and extending to its gills. The mask of the male adolescents and adults turns a pale orange color with brilliant orange on the fins and a black tail. The coloration for the females, however, remains very similar to the juvenile with the exception of the tail turning black and light orange coloration on the pelvic and pectoral fins. These extremely active and beautiful captive bred masked angelfish should be kept in a tank no smaller than 150 gallons with live rock for them to graze and rest. 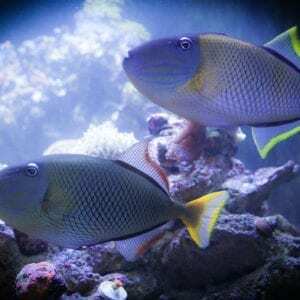 They are predominantly reef safe fish and shouldn’t attack any reef tank inhabitants. 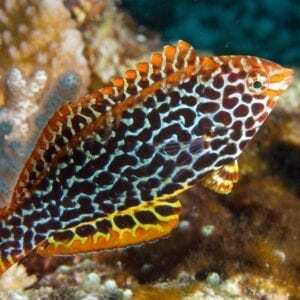 In the wild, these fish live at extremely deep depths, but since almost all specimens are captive bred, they acclimate to normal reef conditions and light easily. Masked angelfish are omnivorous fish. It’s good practice to feed them different types of frozen or live shrimp – such as brine and mysis, nori, and flake or pellet food. Use caution when feeding pellets and any food with white fish as it may cause them to bloat. 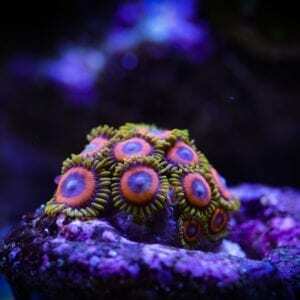 They will also forage the bottom of the tank for worms and small crustaceans. For best results and extended life span, feed daily and only what they can consume in a short time span, 2-3 minutes, two to three times per day along with seaweed 2-3 times per week. Standard water parameters apply for the captive bred masked angelfish: temperature between 70 and 78°F. A pH value of 7.9-8.5, a salinity of between 1.020-1.027, and nitrates and ammonia levels at 0 ppm.